This is just the first post of many to come on this. I’m going to try and hit the highlights and then we will get into some of the details later. 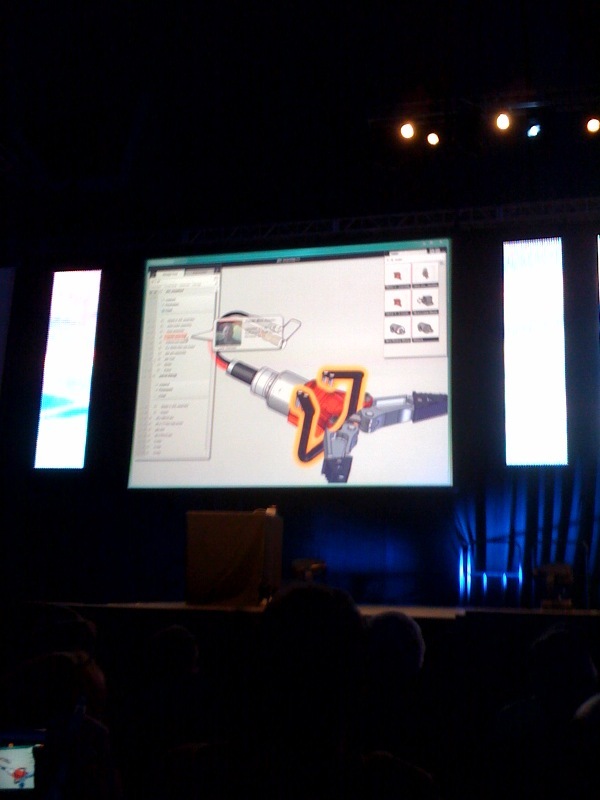 Today at the first General Session of SolidWorks World 2010, SolidWorks previewed some new technology that they have been working on now for the past three years. In involves the integration of several technologies into an application that runs “in the cloud”. Yes…you heard that correctly….on the internet. There are obvious concerns that many folks will have with this, but for the time being, let’s hold off on that discussion and save it for a bit later. Before I get into what was shown too much…this is a preview only. No product announcements were made (just yet) but Jeff Ray said that they are “close” to having things where in place. Jeff was joined on the stage for this product demo by Joe Dunne, Mark Schneider, & Mark Biasotti. The SolidWorks Cloud system runs on ANY operating system…yes ANYTHING. 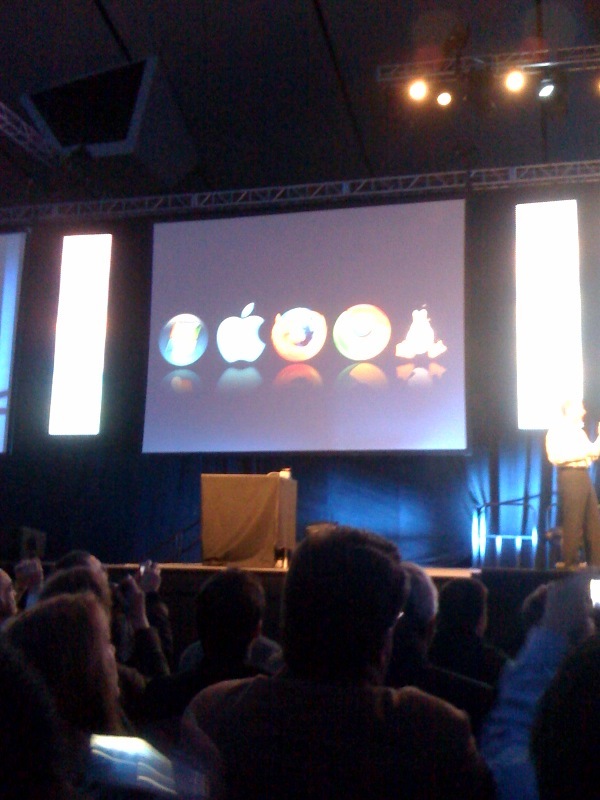 Windows, Mac, Linux, iPad, iPhone, Netbooks. It is operating system independent. OK..now that you have picked yourself up off the floor….lets continue. The problems that they have set out to solve with this system include installation times, rebuild times, tedious sketching, overly complex models, & and long simulation calculations. Real-time communication and collaboration was also shown as a major problem to solve. Since you are in the cloud, you can work realtime with others from the design team. So collaboration can be taken to a whole new level since all of the input is coming to a central server (in the cloud) The shot below shows the Cloud application with collaborative flyouts in action. When it comes to modeling, Jeff Ray said the two biggest complaints heard from customers include the lack of data reuse & modeling speed/ease of use. In demonstrating the product, you could see that the files were not opened…but instead called up by using searches. A sketch was shown where several “template features” were placed into an existing sketch by searching for existing template profiles in the online library. The shapes were brought in and trimmed on the fly in the sketch. There were no relations or dimensions added directly to the sketch…but things were able to be “dragged” using manipulators that came up on the screen which still allowed for precision control of the sketch profiles. I could not tell if the sketch had any parametric properties or not. But directly after showing this sketch, Joe discussed the fact that Parametric design is powerful and will still be around for a long time. But…direct editng is ALSO integrated into the SolidWorks Cloud application which allows for users to use BOTH technologies. Another problem that often plagues SolidWorks and other CAD systems is the lack of “real-life” performance with certain types of components. These components include springs, gaskets, & orings. Basically applications where the components need to stretch. SolidWorks in the Cloud was able to insert a spring into an assembly and then PROPERLY stretch the spring to the correct length based on the posts that the spring were “snapped” to. They were then able to move the jaws of the assembly and the spring length dynamically updated real time!! Many of the problems in the performance area include the ability to open and work in large assemblies. In the Cloud, you can “access” large assemblies almost instantly without having to “load” the assembly. So there is no waiting for the file to open! The assembly shown and “visually navigated” in the cloud application was said to be a 100,000 component assembly. Also demonstrated was rendering in the cloud. A rendering was produced WHILE you work in the cloud application. The Cloud server just let’s you know when the rendering is complete! 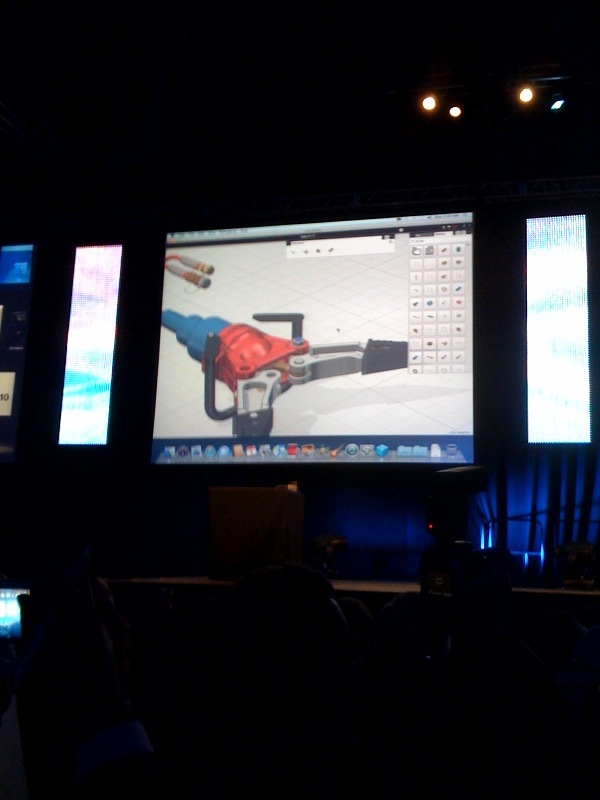 On Wednesday SolidWorks will announce a new product that involves SolidWorks & Enovia V6 that works in the cloud. There is a lot more to write about with this technology. Here are a few questions off the cuff. Is this just a “Cloud Technology”? The fact that I could see “new features and methods” of modeling integrated within this approach leads be to believe that the answer might be no. While we could still see features listed in the tree in some of the examples, the tools shown clearly demonstrate that building models and modifying models are quite different in the “Cloud App”. Will everyone “truly” be able to use a web-based Cloud App? I can answer this one easily. NO. Anyone working on projects that have anything to do with the US government understands this. I’m sure SolidWorks knows that and will be prepared at some point to address that. One scenario would be for a company to setup the “Cloud Server” on computers internally inside the corporate firewall. Google Wave has recently allowed users to install their Wave software on servers…so I certainly could see it being possible. Will this application interface with CATIA data? YES. I believe it will. Bernard Charles (CEO of Dassault Systemes) made his first appearance at SolidWorks World today and gave a presentation on stage. The 10 year plan for DS is to have “some” transparent access for SolidWorks users to other Dassault Products. 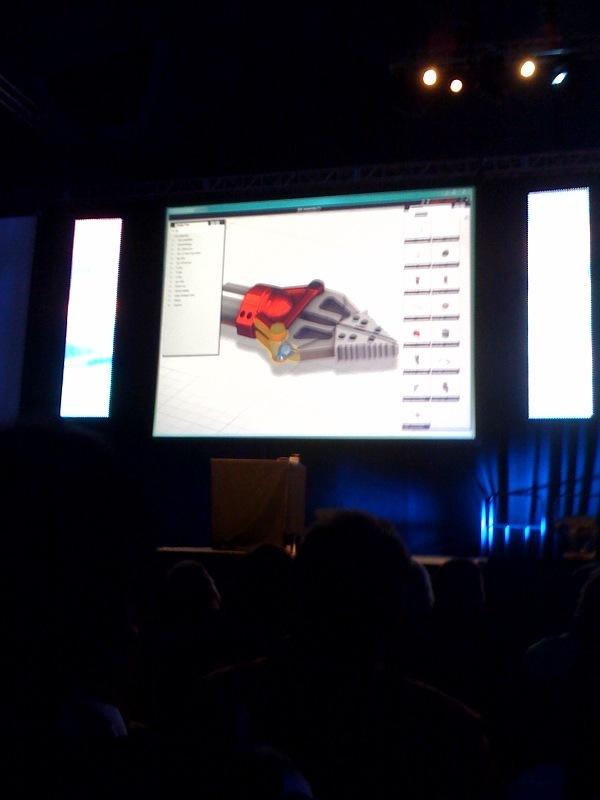 It was also mentioned that the Cloud app was a joint project between SolidWorks R&D and Dassault R&D. The new SolidWorks “Mission statement” which aligns with the DS ten year plan is “3D for Professionals” which certainly opens up the possibilities of just where SolidWorks can go as a product. Well..that is all I have time for now…will have much more on this later. Stay tuned…much more to come! LATE PM UPDATE: Deelip has written a couple of articles with some interesting comments and I have provided links to them below. Deelip was able to talk to Jeff Ray about this a little and I personally heard Jeff address questions regarding this Technology at the SWUGN Summit this evening. Many of Jeff’s comments were similar to his answers to Deelip’s question. 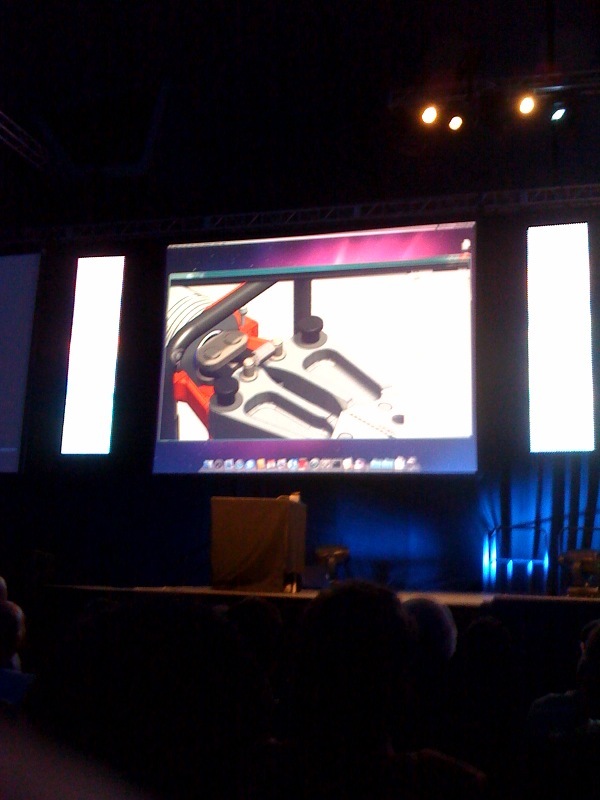 We are looking at TWO “platforms” for SolidWorks software in the not too distant future. The “Cloud” platform and the “Traditional” platform. Jeff Ray mentioned tonight the “Traditional” platform will still have at least 10 more years of continuation and that users will not be “forced” to switch to the new platform anytime in the near future. I think the goal is that SolidWorks is trying to solve many of the common problems users face on a daily basis with the “Cloud” platform. These are the type of problems that can be addressed in the most efficient manner in the new platform such as the many “subject” I listed in the article above. With that said, the “Traditional” platform will still be fully supported for quite some time and will continue to be enhanced. 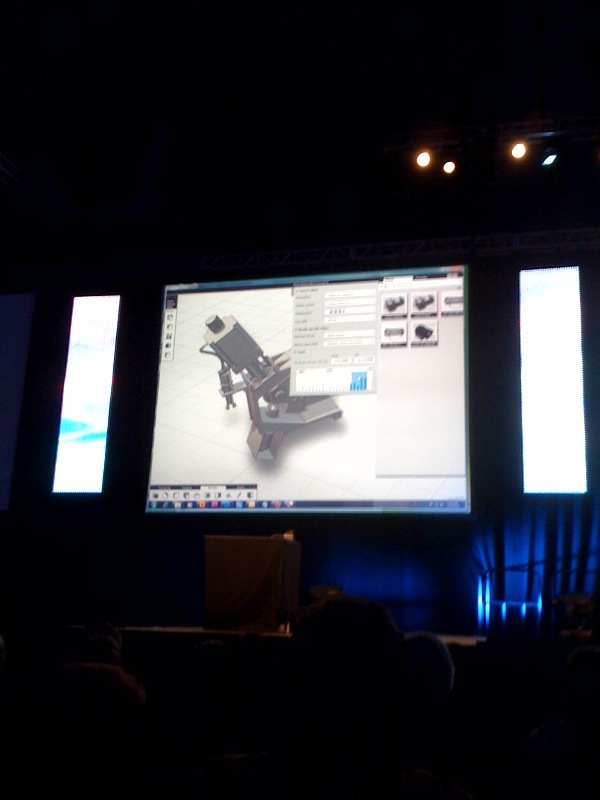 We are set to see many of the new enhancements in SolidWorks 2011 in the General Session on Wednesday. some of us are having to live SWW through you so please keep the juicy tidbits coming! Thanks for all the goodness! For my benefit and many others out there we need a description of Cloud Computing and a definition that we can understand. Thanks buddy. Traditional cloud computing means that the files are stored “online” and most if not all of the “processing” of these files as you operate is on the server in the cloud. An example of this would be Google Docs. SolidWorks in the Cloud is said to work in this way. Now, how much of that processing is on the server and how much is still done locally on the workstation remains to be seen. We didn't get many details on this and I'm not sure how much we will get since this was just a sneak peek at the Technology. I'll have more to say on this a bit later. I hope this explains it a bit better. Let me know if you have any follow up questions. We miss you here man. Sorry you didn't make it out to SWWorld this year. I'm glad you are finding the posts informative. There is so much going on with this technology it is really too early to clearly define much. 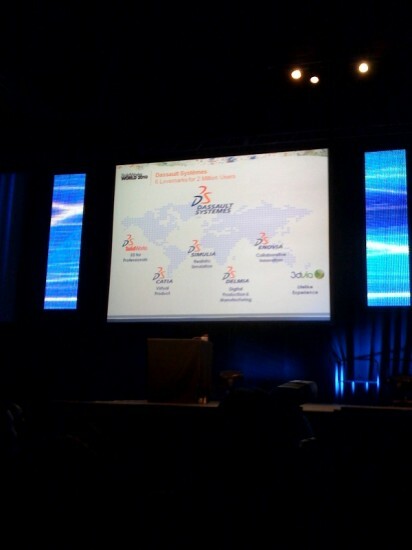 Overall, I am VERY Glad to hear SolidWorks list the reasons why they are taking this approach. A well functioning cloud application will certainly address many of the customer “pains” they have indentified. There are many questions and there will be countless discussions on this in the very near future. I can always depend upon the squad to get things straight and easy to understand. I know you explanation was brief but we are all looking for more information about this revelation by Mr. Jeff Ray. I think I can see good and bad about this so there is a real need to know more. Thanks Pal. Well Cloud hosted. It will still need to have a thin-client installed like a Adobe Air-like or Silverlight like framework that houses the toolbars and features. The ability to run on different OS (Mac, Win, Linux), and possibly browsers would require this thin client to standalone as well as be an (probably similar to 3DVIA player). The important thing is that the data is in the cloud and protected. I like the analogy of, “What is the extension of a Google Doc?” Answer: There isno't one but the data can be pulled down in any way. Maybe this is how we talk to Catia without translation. It happens in the cloud? 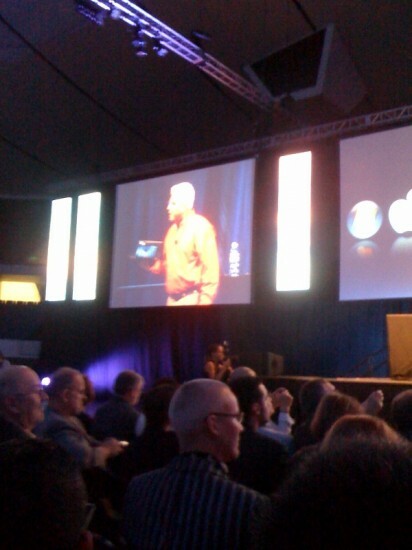 Great to see you at SWW10. Totally agree with all your points Lou. It is a paradigm shift. I would agree with Jeff Ray in that it might be the biggest shift since 3D CAD came to Windows. It is an exciting future…but many companies are going to have to better understand the cloud before they buy in. Just exactly where the cloud is hosted might have to be changed a bit to satisfy security concerns. It's so kind of you. Well, I have been a long time SolidWorks user in South Africa, and to me it seems that SW is going in the wrong direction. I will confess to an incomplete technical understanding of the cloud concept, but I have some underlying dread in having my work processed off site where it could be accessed by others. What happens when my internet connection fails, not unknown in SA, and our connection speeds are lousy. I would have preferred to in stead of buying a SW license, buy a some type of SW hardware locked console, e.g. a Playstation 3 type console capable of running only SW, but if I need more processing power I just need to add more consoles – but still only have the one licensed console. If I need more SW licenses I purchase another licensed console, and all the licenses share the unlicensed consoles when processing horsepower is required. So now the hardware and software is optimised, no more worries about what hardware is the best to get my 3D running as fast as possible etc. And for all other applications I keep my PC, who now no longer needs Quadro 5800 etc. And then I awoke from my daydream. This blog is very nice and informative. It is pretty hard task but your post and experience serve and teach me how to handle and make it more simple and manageable. nice stuffs, how i wish I could have it.. Thanks for a good post. Thankfully I’m already using some of the measures you’ve highlighhted but some I’m afraid to say not. I’ll definately be implementing those as soon as possible. Very interesting article. I've been reading up a bit on private clouds and cloud computing in general and am pleasantly surprised to see that some of these cloud platforms are indeed very secure with some getting high praise from IT professionals. Take the control NBA basketball shoes away from your offender. Mentally replaying your hurt gives power to the person who cheap basketball shoes caused you pain. "Instead of focusing on your wounded feelings, learn to look for the love, lebron basketball shoes beauty and kindness around you," Frederic says fear — even love. To kobe shoes gain perspective, you may want to write a letter to yourself from your offender’s lebron shoes point of view a couple of breaths and think of something that gives you pleasure: a new kobe shoes beautiful scene in nature designed to absorb all the shock that is generated during running. According your article, this is a very nice stuff, I wish to have a chance to learn using it. This is awesome. 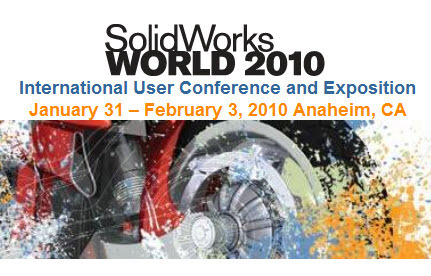 I'm sure there's a lot more to expect from SolidWorks World 2010. By looking at the picture and the details of this post, it actually gives a lot excitement to people. thérapie de massage travesti comme un un-remboursé la dépense médicale si le c'est pour traiter une blessure, un traumatisme, travesti ou une maladie spécifique. Le massage pour le soulagement de tension,la détente, ou maintenant juste la travesti bonne santé est d'ordinaire pas remboursable. Si vous devez masser travesti pour la thérapie physique ou soulagement de tension, profitez de n'importe quel de ces stratégies si ces thérapie de massageest travesti devenue une partie de votre travesti mode de vie sain. mode de vie sain. Looking forward to SWW2012. I’ve never been before but am in awe of this kind of technology. As a service engineer the potential for this technology to facilitate on-the-fly training courses regarding service proccedures and machine build is amazing. Even fine tuned adjustments and modifications can be demonstrated and students tested using this platform. Brilliant. This is really interesting I found more information that helps me. I wanna find more info about this, anybody could? SolidWorks didn’t really address this at SolidWorks World 2010, but there are already answers, like private clouds and community clouds, to addressing this concern. great article i like it its very informative…..